Our assignment yesterday had to do with assessing our clothing budget and possibly making some changes in the way we view fashion and its influence on our spending habits. I’ll be honest. Recently I’ve been fighting the desire to buy a new pair of boots. I don’t need boots. I have a brown pair and a black pair. But they both have a heel, and I would like a pair of brown riding boots. When I actually type that out and read it back to myself, I cringe because I sound like a spoiled brat. And I’m glad it has that effect on me. My husband doesn’t have a job, we’re living on my Etsy income, and I am actually entertaining purchasing a new pair of boots? It just goes to show that even a thrift-store shopping, bargain-seeking girl who couldn’t identify a Coach purse if it bit her on the hand still struggles with wanting stuff. I am not immune. Gift giving happens in so many different ways throughout the year, but let’s focus on Christmas since it’s fast approaching. I’m not going to reinvent the wheel here. Tsh from Simple Mom did an excellent post four years ago about how to Enjoy a Simple Christmas with a Well-Planned Budget. Between her suggestions and the comments that were left by others, you will find a wealth of tips that you can sort through and decide which ones you might like to try this year. This week I’ve been celebrating the one-year “Etsy-versary” of my shop with some specials for my readers and customers. Today will be the first of two giveaways. 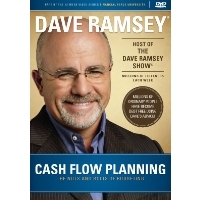 I have a sealed copy of Dave Ramsey’s DVD Cash Flow Planning: The Nuts and Bolts of Budgeting that I would love to send along to one of you. All you have to do is leave a comment below sharing one way in which you have benefited from this budgeting series so far. That’s it! And be sure to include your email address when you fill out the comment form so that I know how to reach you if you win. and ends on Thursday, October 18, 2012, at 10:00 PM PST. This giveaway is closed. Please click here for the winner. The framework for this series is being used with permission from Inexpensively.